Mimulus guttatus, Spotted Monkeyflower, is fairly common along the creek above the Railroad Canyon Campground in the central Black Range of New Mexico, USA, during the summer. Other English common names for this species are Seep Monkeyflower, Common Large Monkey-flower, Golden Monkeyflower, Stream Monkey-flower, and Common Yellow Monkeyflower. The corolla (the term for all of the petals) is such that it practically blocks entry into the flower tube. Bees, which pollinate this species, must rub against the pollen on the lower petal, to gain entry into the tube and access to the nectar - a very effective design for the transference of pollen. 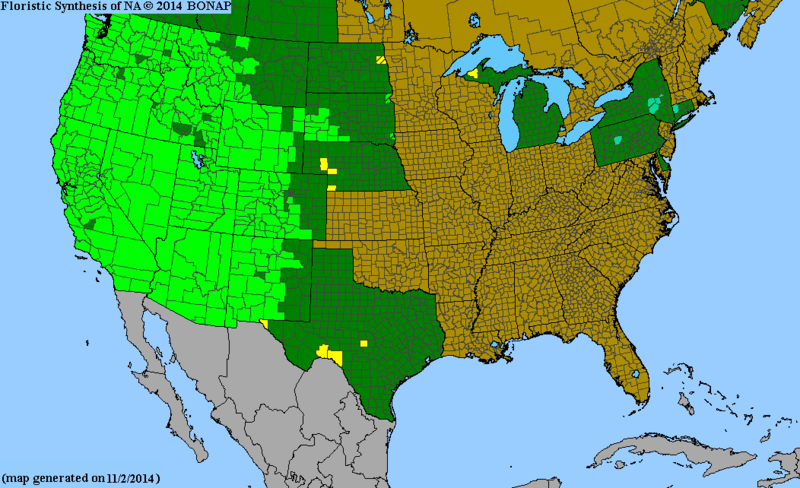 The BONAP range map, right, shows the range of this species within the United States (and partial information for Canada). The light green color means that the species is native and “not rare” in the county indicated. It is also found in northern Mexico. This is a extraordinary species which grows in a extensive range of habitats and is found in both annual and perennial forms. It has been the subject of more than 1,000 scientific papers. Mimulus guttatus was first described by Augustin Pyramus de Candolle. There are many scientific synonyms for this species. Various sources have argued that the species should be split. The Native American Ethnobotany Data Base has several listings for uses of this species.